eEnzyme has a wide range of glycosylated 6xHis-tagged recombinant HIV / SIV proteins expressed and purified from 293 cell line, including many full-length versions and trimers. The human immunodeficiency virus (HIV) is a lentivirus (slowly-replicating retrovirus) that causes acquired immunodeficiency syndrome (AIDS), an infectious disease in which progressive failure of the human immune system leads to life-threatening opportunistic infections and/or cancer. Two types of HIV have been characterized: HIV-1 and HIV-2. HIV-1 is the virus that was initially discovered and termed both LAV and HTLV-III. It is more virulent, more infective, and is the cause of the majority of HIV infections globally. Both HIV-1 and HIV-2 are believed to have originated in non-human primates in West-central Africa through the evolution of a simian immunodeficiency virus (SIV) that infects wild chimpanzees. Three groups of HIV-1 have been identified on the basis of differences in the envelope (env) region: M, N, and O. Group M is the most prevalent and is subdivided into eight subtypes (or clades), based on the whole genome, which are geographically distinct. These are subtypes A, B, C, D, F, G, H, J and K.
HIV-1 viral particles have a diameter of 100 nm and are surrounded by a lipoprotein membrane. Each viral particle contains 72 glycoprotein complexes that are integrated into this lipid membrane, and each of the glycoprotein complexes is composed of trimers of an external glycoprotein gp120 and a transmembrane spanning protein gp41. The bonding between gp120 and gp41 is loose and gp120 may shed spontaneously in the local environment. gp120 may also be detected in the serum as well as within the lymphatic tissue of HIV-infected patients. The matrix protein p17 is anchored to the inside of the viral lipoprotein membrane. The p24 core antigen contains two copies of HIV-1 RNA. The HIV-1 RNA is part of a protein-nucleic acid complex, which is composed of the nucleoprotein p7 and the reverse transcriptase p66 (RT). The viral particle contains all the enzymatic equipment that is necessary for replication: a reverse transcriptase (RT), an integrase p32 and a protease p11. The HIV-1 RNA genome consists of at least seven structural landmarks (LTR, TAR, RRE, PE, SLIP, CRS, and INS), and nine genes (gag, pol, and env, tat, rev, nef, vif, vpr, vpu, and sometimes a tenth tev, which is a fusion of tat env and rev), encoding 19 proteins. Three of these genes, gag, pol, and env, contain the information needed to make the structural proteins for new virus particles. For example, env codes for a protein called gp160 that is broken down by a cellular protease to form gp120 and gp41. 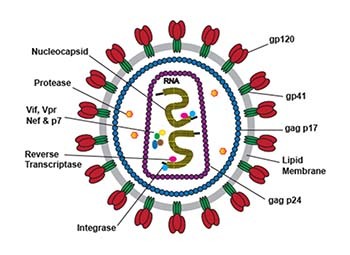 The remaining six genes, tat, rev, nef, vif, vpr, and vpu (or vpx in the case of HIV-2), are regulatory genes for the proteins that control the ability of HIV’s infecting cells, producing new copies of virus (replication), or causing disease.